These fast-play rules allow entire armies to be represented by less than 50 figures. The booklet also includes a campaign system, and over 200 army lists. DBA was the first game in the DBx series, which now includes DBM (a more complex version of DBA), HOTT (a fantasy version), and DBR (a renaissance version). Each figure represents an unstated number of actual combatants. Each army is composed of 12 elements (stands). Ground scale is 1" = 100 paces (when using 15mm figures or smaller; double for 25mm figures). One turn represents 15 minutes. Can be used with 25mm, 15mm, 6mm, or 2mm figures. The width of the base depends upon the scale of figures being used; the depth depends upon both figure scale and type. The number of figures per base also depends upon the figure's type. For instance, an element of 15mm swordsmen is composed of 4 figures mounted on a 40mm (frontage) x 15mm (depth) base; a 15mm elephant is mounted alone on a 40mm x 40mm base. Version 1.1 (March 1995) available from Wargames Research Group (WRG). I've been with the DBx series of games - DBA, DBM, DBR, and HOTT - from the very first. Of these games, DBA (and its fantasy equivalent, HOTT) is extremely fun and fast. Once one gets past the authors' somewhat tortured English, the rules are easy. I can teach a newbie the game in about 30-45 minutes. We can get 4-6 games done in a typical gaming session - including the normal badinage between and during games. It's easy to purchase and paint an army or five for these rules. This is particularly nice if one likes to play in 25mm scale. This is the perfect set of rules for fighting and resolving campaigns in a reasonable amount of time. Designing an interface between strategic board games like Imperator or Machiavelli is also easy and rewarding. The downside to DBA is that all of the armies have exactly the same number of elements - 12. (This is not so in HOTTs.) To me, this is extremely irritating. On a scale of 0-10 (bad to good), I rate DBA an 8. This compares to a 9 for HOTT, 7 for DBR, and 6 for DBM. 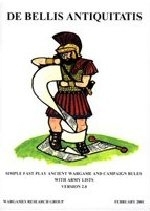 After using a number of commercial and in-house revisions of commercial Ancients wargames rules for nearly 30 years, I welcome DBA as giving the era new life for me. Yes, there are some problems in Barkerese, and no, not all eventualities are covered in these rules, but they are very playable nevertheless. I have found that DBM can help clarify some of the movement/formations problems not explained in DBA, and set-up points can "enlarge" games well beyond the 12 stand limitations. (Eight-sided dice should be substituted for six-sided then.) The resource pages on the Net have been extremely helpful, too. I've been playing DBA for some time now, and feel that the basic system is excellent for an hour's enjoyment that does not result in the interminable arguments that seem to mar so many other, more complicated, rulesets. Wargaming should be fun, and these rules enable us not to lose sight of that fact. My friends and I have also played around with DBA to cover other periods of history, such as Napoleonics and AWI. DBA can give a "feel" for the period being played, but if you want more complexity in the game - to cover morale, training etc - then why not try DBM? On the whole, an excellent set of rules to put the enjoyment back into gaming. I know of a number of people who have started their wargaming obsession by playing this particular ruleset. I think DBA (1.0) is a better model of "ancient" combat than DBM; I feel like I am only making the CinC's decisions, not trying to micro-manage the tactics. Yes, the movement rules were written in "WRG Gibberish"; But a lot of the problems are players who take the game too seriously. It's only a game. No pretense of historicity - "it's just a game"
A good friend likes DBA because it allows him to do Ancients miniatures occasionally - most of his effort is spent on Napoleonics and ACW. DBA is a good "every once in a while" game. I can't see that it has enough depth to keep a serious ancients gamer going very long. DBA is a good learning tool, I think. I reduces things to their absolute basics and forces the player to think about dispositions. No way I was ever going to have all of those in full size armies. The drawbacks have mainly to do with the sizes of the armies. Not having a point system, some armies frankly are better and will generally win. The Slavs sucked. This page by Chris Brantley (brant@erols.com) includes guidance to newbies, rules and army list variants, and much other material. Steve (gromit+@CMU.EDU) shares his enthusiasm for DBA and shows us his latest armies. Also rules for Double DBA, alternate terrain rules, etc. Nunawading Wargames Association's page for DBA-related rules. Includes reference sheet and photo gallery. Keith Barker's (keithb@april.se) website has pictures of a sample army and various camps. Steve Burt's (sburt@mdsi.co.uk) rules for an 'on-table' campaign which is a stylised version of Alexander's Successors. "Dedicated to all matters regarding the miniatures rules De Bellis Antiquitatis. Discussion on the rules, scenarios, OOB, Q&A, future development, etc. Note the focus is on DBA, as opposed to discussion on the DBx family of games as a whole." Since DBA and DBM are sister games, they are often supported by the same online resources. For instance, check our DBM webpage for a link to Ed Allen's DBM webpage. The DBM page also explains about the DBM mailing list, which supports all games of the DBx family.